SUPER EASY AND FAST: Easily removes stubborn or fragile corks. Open any bottle of wine in seconds with a simple pull of the lever. Eject the cork from the screw just as easily. GREAT GIFT FOR WINE LOVERS: Comes packaged in a classic black gift box ideal for gift giving and storage. Makes a perfect present for weddings, birthdays, holidays, housewarmings, and more. Gift set includes extra screw and Foil Cutter in matching finish. GUARANTEED FOR LIFE: If you're not delighted with your WineTools PRO Wine Opener, simply return it at any time for a full refund of your purchase price. SHIPS FAST! Send directly using Amazon Prime with no need for additional gift wrapping or packaging! ... Click 'Add to Cart' to treat yourself or someone special to this memorable gift! To include message select "gift" at checkout. 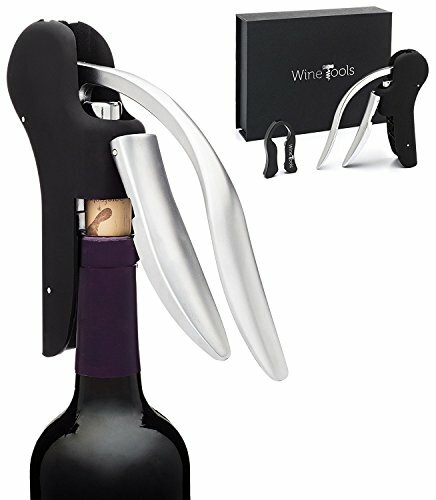 If you have any questions about this product by WineTools, contact us by completing and submitting the form below. If you are looking for a specif part number, please include it with your message.